Passivhaus is an international energy performance standard with buildings constructed to the Passivhaus standard reaching 30,000. Passivhaus buildings have been constructed in every major European country, Australia, China, Japan, Russia, Canada the USA and South America….a research station has even been constructed to the Passivhaus standard in Antarctica! The core focus of Passivhaus is to dramatically reduce the requirement for space heating and cooling, whilst also creating excellent indoor comfort levels. This is primarily achieved by adopting a fabric first approach to the design by specifying high levels of insulation to the thermal envelope with exceptional levels of airtightness and the use of whole house mechanical ventilation. In a Passivhaus thermal comfort is achieved through use of passive measures listed below which can be applied not only to the residential sector but also to commercial, industrial and public buildings. A common misconception is that Passivhaus only applies to cold weather climates when it actually works equally we in warm and hot climates. 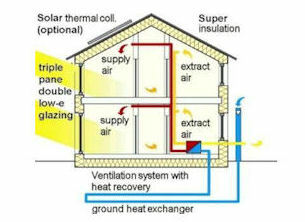 High levels of airtightness and insulation work equally well in protecting buildings from overheating provided there is adequate solar shading. Whilst it is possible to achieve the new build Passivhaus standard in the refurbishment it is often difficult to achieve without undertaking major works. The EnerPHit standard has been developed as a refurbishment guide for Passivhaus renovations and refurbishments.